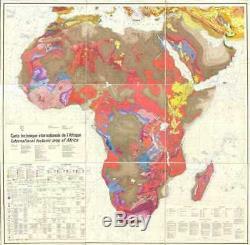 1968 Association of African Geological Surveys Geological Map of Africa. WE SELL ONLY ORIGINAL ANTIQUE MAPS - NOT REPRODUCTIONS JOIN OUR WEEKLY MAILING LIST FOR NEWEST STOCK. Title: Carte tectonique internationale de l'Afrique. / International tectonic map of Africa. The map depicts the continent from the Atlantic Ocean to the Gulf of Oman, the Arabian Sea, and the Indian Ocean and from the Mediterranean Sea to the Cape of Good Hope. Meticulously detailed, it is apparent that the most up-to-date information available was consulted when compiling this monumental work. An extremely detailed legend, which is situated in the lower left corner, and a list of consulted works, in the lower right corner, explain the various notations used and where the information was sourced. Countries throughout the continent are labeled, some of which were known at that time by names that are no longer used today. Rivers, lakes, and deserts are also labeled. After just one glace, the geologic complexity of this immense continent is immediately apparent. Size: Printed area measures 74 inches high by 74 inches wide. If your address is a P.
DHL International EXPRESS (45 USD). We can use your Federal Express Account. Duty varies by country and we cannot predict the amount you will be charged. Some countries are duty free, others are not. Additional Services Conservation Framing Services: Geographicus recommends basic conservation framing services for any antique paper. We do not offer this service. Antique Map Restoration Services: Geographicus can repair and restore your antique map. Services include deacidification cleaning flattening and backing. The item "1968 Association of African Geological Surveys Geological Map of Africa" is in sale since Tuesday, August 21, 2018. This item is in the category "Antiques\Maps, Atlases & Globes\Africa Maps". The seller is "geographicusmaps" and is located in 11221. This item can be shipped worldwide.